When laid directly on the basement floor, traditional carpeting alone is not appropriate for a basement finishing project. Water leaking into the basement from the walls and or coming from plumbing leaks as well as water vapor seeping through concrete basement floors will find its way into your basement and collect in the carpet. Soon, mold and mildew will form, releasing musty smells into your finished basement and adversely affecting your health. All too soon, your carpet will have to be ripped up and replaced. Total Basement Finishing has a better solution. Contact your local dealer to find out more and schedule a free estimate for basement flooring! When you meet with your basement remodeling contractor, ask him or her to talk with you about installing ThermalDry® Carpeted Basement Flooring to your basement finishing system. Like all ThermalDry® tiles, it creates a thermal break in your basement floor and a vapor barrier that prevents moisture from the concrete basement floor to reach your carpet or create humidity in your basement air. The carpeting is also inorganic, which means that it will never promote mold growth or rot like normal carpeting would. When you install wall-to-wall carpeting, you commit yourself to a long, unbroken sheet. It's beautiful when it's first installed, but in the back of your mind, you'll feel the lingering threat of a stain, tear, or worn area on your otherwise perfect carpeting. What can you do if your wall-to-wall carpet is stained or damaged in a way that you cannot repair or clean? Empty the finished basement, tear out the entire carpet and replace it at great expense? Hide the mark under a piece of furniture? Live with the stain? There's no good answer. 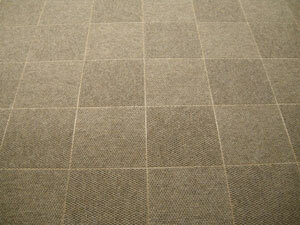 This is a mix of horizontal and vertical patterned ThermalDry® carpet tiles for basements. We have Mocha and Charcoal colors available. 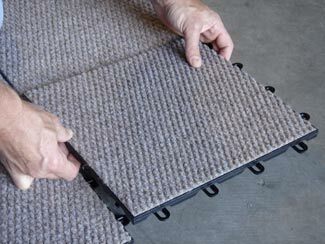 ThermalDry® Carpeted Floor Tiles are simply a better solution for basement carpeting. Available in 1'x1' square interlocking tiles, each tile is a separate, removable piece. This means that if one becomes stained or damaged, it can either be relocated to another section of the finished basement or conveniently and inexpensively replaced without having to replace the entire system. 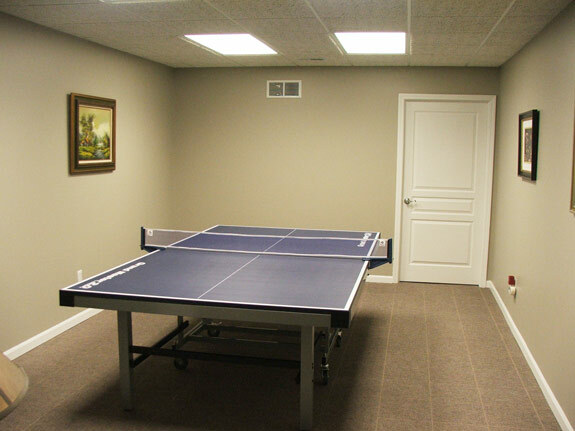 Total Basement Finishing has several other basement floor covering options, including the MillCreek faux wood basement floor planks and the ThermalDry® faux ceramic basement floor tiles. These two options have all the same qualities of mold-resistance and creating the thermal break that the ThermalDry® Carpeted Basement Floor Tiles does. 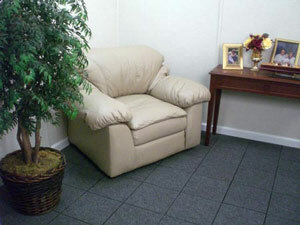 Call or contact us online for a Free Basement Carpeting Tile Estimate Today!